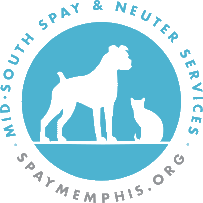 Mid-South Spay & Neuter Services is a 501(c)3 non-profit clinic dedicated to reducing pet overpopulation and high euthanasia rates by offering affordable spay and neuter surgeries to the public. The clinic has operated since 2005 and has performed over 37,000 spay and neuter procedures and counting. In addition, the clinic offers age-appropriate pet vaccinations and micro-chipping, which are done at time of surgery.